Our goal is to convert high end luxury, sport and other vehicles to be completely electric. Lightweight, manual transmission vehicles will always provide the best conversion. Contact us for a free consultation on donor cars or what can be done using a car you already have. Before deciding on a make and model, there are a lot of factors to be considered including weight, interior space, and driving enjoyability. We are constantly upgrading our flagship Porshe 944 with the latest EV tech. Please contact us to schedule a test drive to see if driving an EV is right for you. Once a donor vehicle has been acquired, the main EV elements must be selected to suit the client's driving style, range requirements and budget. There are a large variety of motors, batteries and control systems available in the retail market today, and it is our goal to choose the best combination for each and every unique project. No EV and driver are exactly the same, nor should every conversion use the same setup. After the elements have been chosen, a detailed analysis of the donor vehicle will take place. Design elements will be discussed, such as interior modifications, adding lightness, battery locations, labeling, and any vehicle specific modifcations required. Starting the conversion, we remove and sell all of the ICE parts. Any money that is recovered from the donor car comes directly off of the conversion charge. Customized elements will be designed at this stage, including the battery housing, clutch adapter plate, wiring, motor mounting, etc. All of the parts will be ordered at this time as well. Any custom parts required may have longer lead-times, which will be dicussed before anything is ordered. If you are converting your daily driver, we can have all of the parts required delivered before we take your car to our garage in order to minimize down-time. The conversion process can be lengthy and will vary considerably for each vehicle. On average, expect the process to take approximately two to three months. During this time we will also help the client set up their home charging station, and a station at their most common destinations if possible. After the conversion, we will administer a number of performance tests to ensure safety, functionality, expected range, and quality of the EV systems. The EV will be delivered to client's home and charged in their garage. We will also give the new owner a thorough walk-through of their 'new' EV, and any maintenance procedures required. All of the systems will be identified and explained. All of the safety systems will be identified and re-tested. We will then take the new owner for a test drive, so they can get a feel for their new car, ask any questions they have about driving styles, increasing efficiency, or how to interperet any of the new instrument cluster elements. Once the client is satisfied, we are satisfied. EV Fest 2012! Bigger! Better! 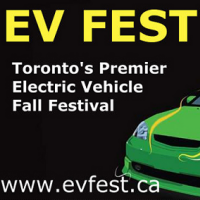 Attending EV Fest 2012? We Are!